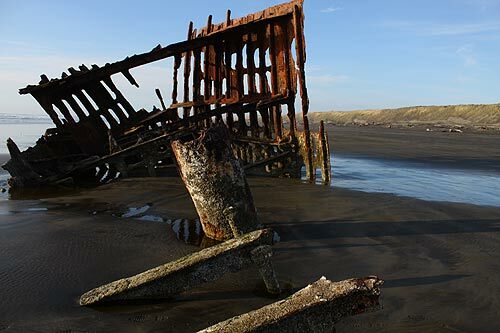 (Oregon Coast) - In late 1906, a four-masted steel barque called the Peter Iredale set out from Mexico on a long ocean voyage to Portland, Oregon. 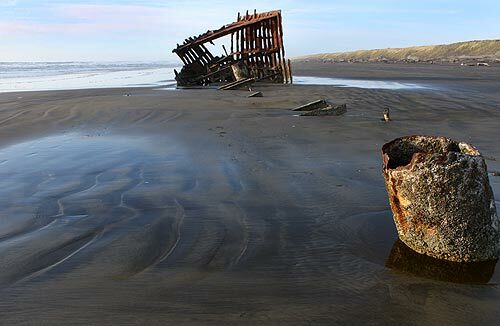 As the cliché goes, its final stretch on the ocean was a “dark and stormy night,” and the wee hours of October 25 were its last stint on the water, joining a long lineage of dozens and dozens of shipwrecks along this part of the north Oregon coast. 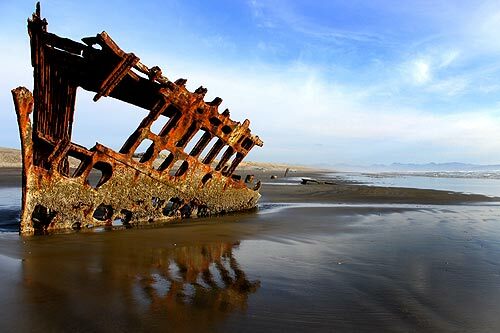 Now, its rusted bones sit immersed in the sand and are one of the coast's biggest tourist attractions, and purportedly among the world's most photographed shipwrecks. The Iredale was built in 1890 by a British shipping firm called Iredale & Porter, which owned and operated it thereafter. Some historical documents even indicate their shipping business included some slave trading at one point. When the ship left Mexico in late September, under the command of Captain H. Lawrence, it purportedly had two stowaways, and it was to pick up a load of wheat in Portland for the U.K. In the middle of the night on October 25, it made it safely to the Columbia River Bar and was waiting for a bar pilot boat to haul it over the that bump in the river. At some point, a heavy wind picked up and strong currents took over. 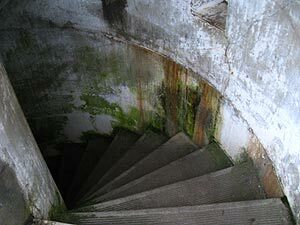 Before they knew it, the Iredale and her crew were taken a ways south and wound up in the breakers at Fort Stevens, not far from a huge concrete battlement built during the Civil War, called Battery Russell. It hit this section of Clatsop Beach so hard three of the masts were snapped off. No one was seriously injured, even in the push to abandon ship in this inclement weather via life rafts. The crew fired off rockets to alert authorities and ask for help. All 27, including the two stowaways, made it to shore in the rickety little boats. This was before the advent of the U.S. Coast Guard, but there were lifesaving station crewmembers at Point Adams - part of what is now Fort Stevens State Park - and these men came to the aid of the Iredale crew. In a very famous and dramatic moment, Lawrence toasted the ship with a bottle of whiskey on that beach, and told his crew to also take a drink. “May God bless you and may your bones bleach in these sands,” the captain said to the wreckage. A subsequent inquiry by the British government deemed the crew not responsible for the mishap, agreeing they did everything they could to save the ship. Newspapers at the time reported it became an immediate hit with tourists, even in the nasty weather of the season. A railroad company even had plans for a while to build a track practically straight to it. There were actually plans to drop the vessel back into the water as it was still in seafaring shape. 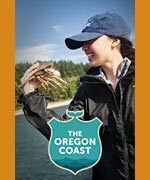 But planners waited too long, and the usual Oregon coast storm season buried it in too much sand to make this idea work. It was dismantled as much as possible and the chunks sold for scrap. Over the years, the wreck has become increasingly immersed in sand, sometimes showing more during winters where sand levels decrease substantially. 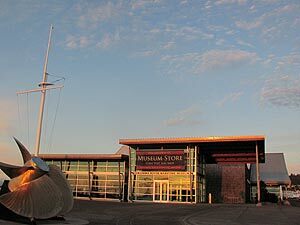 Its propeller is now seen outside the Columbia Maritime Museum in Astoria. In the early 40's, it was the inadvertent target of the only attack on mainland U.S. soil during World War 2. A Japanese sub shelled this part of the beach late one night, lobbing shots practically right at the wreck. These created craters the size of a man, and some were scattered in and around the wreckage, although none hit it directly. It was unharmed by this one-sided battle between the U.S. and Japan. The massive guns of Battery Russell did not fire back at the submarine because it did not want to give away the location of American weaponry at that site. Ironically, decades later, the captain of the Japanese sub admitted he did not know such a base was there, and he would not have fired on the area had he known this. 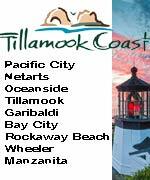 The event opened the eyes of locals and caused them to further fortify and guard the Oregon coast during wartime. This included the planting of barbed wire along much of the length of Clatsop Beach, and the Wreck of the Iredale was utilized in this. The wire fencing was intertwined around the wreck and stayed that way until the end of the war.